← Do We (Still) Need Vancouver? Resiliency: It’s who ya know. That alone begs a classic, chicken-n-egg question: Did the leisurely lure of the suburbs kill our sense of community? Were our social ties unwittingly severed by the meandering disconnection of subdivisions and strip malls or was sprawl just a symptom of something larger? After all, for all their rewards, meaningful relationships take a lot of work. Perhaps, once the modern world elevated our prospects for personal independence, we cut those ties ourselves, willingly, lest our happy motoring be weighted down with excess baggage. It’s who we are. And it’s a problem. I get it. The appeal is undeniable and it works just fine… until the party ends. And there’s increasing indicators that that’s exactly what’s happening. Odd Fellows, the fraternal organization that brought the mechanics of communal self-reliance to America in 1819. Today, the breakdown of local community has robbed us of our historic safety net. One in which half the population once belonged to a fraternal organization and from it received everything from fellowship and business opportunity to health care, lost-wage insurance and burial benefits. In its wake, we find a nation where the available support structures for the average person now number exactly two. At the one end, we have personal and family resources. You against the world. At the other, we have enormous institutions like the Federal Government or BP or United Healthcare. The faceless behemoths. And in between? Our once robust networks of interdependent social, religious, institutional and commercial resources have largely withered on the vine, leaving currently en vogue cries for “less government” ringing a bit hollow. After all, when you strip away big gubmint, our primary source of support in a nation now devoid of Tocqueville’s admired communal unity, who’s gonna pick up the slack? Oh, I remember. We’re a nation of rugged individuals who can fend for ourselves. Right. "I, like every American, can fend for myself!" Of course, that’s not really true. There may always be the classic woodsman out there, living off the land but, for the majority of us, a stable economy, cheap energy, well-stocked grocery stores, big boxes filled with Chinese creature comforts, digital information at our fingertips, and endless sources of entertainment-on-demand have simply lured us into thinking we’re the masters of our own domains. As though self-reliance were actually easy. Resilient communities are connected communities and there’s a growing body of research to back that up. Furthermore, there’s more than a little evidence indicating that the strength of those connections is fostered, in part, by the form those places take. That’s right. I’m talking about traditional urban form. Walkable, neighborly Smart Growth. Community design designed for the complexities of community. Given the less-than-desirable state of our economy and the national financial obligations that go with it, common sense would dictate that we invest in the strength of our community ties as a reasonable tool for reducing demands on the Fed. Yet, curiously, those most concerned with whittling down the size of government are more often than not the same ones opposing the local community visioning and smart growth planning efforts necessary to restore the social fabric that makes such reductions possible. Add to that the off-putting tenor of sustainability discourse. Day in and day out, it’s consistently predicated on unthinkable scenarios — natural disasters, climate change, peak oil, global financial meltdown. From a rhetorical perspective, this is done to create a sense of urgency but, in terms of motivating our efforts to rebuild local social networks, it tends to have the opposite effect. Those things are just too big, too complicated or too uncertain to wrap our heads around. Justifying the effort to meet the neighbors now requires we buy into global warming? Aw, jeeez. Just forget it then. Instead, I propose a new premise. A simple premise. Change happens. That’s it. It is, without dispute, inevitable that change will come to our communities. It may take the form of a locally unique challenge or it may be the effects of something larger trickling down upon us. Something we brought upon ourselves or something unfairly levied. It may be change for the worse, bringing with it great tragedy, or it could equally be change for the better, revealing tremendous new opportunities. Whatever form it takes, the reigning constant is this: The deeper our sense of community, the stronger its connections, and the more robust our web of interdependent relationships, the better positioned we’ll be to take it on and manage it effectively. Connected communities are competitive communities. And those willing to compete are those best positioned to win. Recognizing the practical value of strong, local community is not a difficult proposition. The more we admit that we need each other and, in turn, make ourselves available to others, the better off we’ll be. Many of us are already hard-wired to do this. Which means the role for municipalities is to simply make it easier — in the form of policy, expenditure decisions and growth planning. One example I’m closely familiar with is right here in my hometown. Decatur, Georgia’s community-wide strategic planning effort in 2000 revealed something interesting: The surge of newcomers descending upon this revitalizing city, as well as the long-timers greeting their arrival, wanted the city to take an active role in connecting people by providing a central clearinghouse of civic-minded opportunities. In response, the city created Volunteer! Decatur, which coordinates volunteers for city-sponsored events as well as maintaining a referral database of local, non-profit opportunities. Give ‘em a call, tell them how you might be useful, and they’ll point you in the right direction. The city was simply responding to expressed need but, as it turns out, they were creating value as well. Not just in the terms discussed here, where a more robust community can better weather change in the future, but in the here and now. Over the course of roughly eight city-sponsored events each year, volunteers contribute 13,000+ man-hours. Hours which, if gauged according to the skills employed, translate to over a quarter million dollars in value. Each year. And that’s not counting all of those steered towards the non-profits tirelessly taking on social imperatives that, in their absence, would fall on the shoulders of… you guessed it: government. Put a price tag on that. But even better, in the course of all that volunteering, all those civic-minded participants met other civic-minded participants and forged the connections that have since resulted in things like community gardens which, in turn, inspired our local farmers’ market and farm-to-school initiative. That’s how community grows. Of course, it’s not just about food. It’s a lot bigger than that. It’s about cooking up the tasty stock of resiliency. 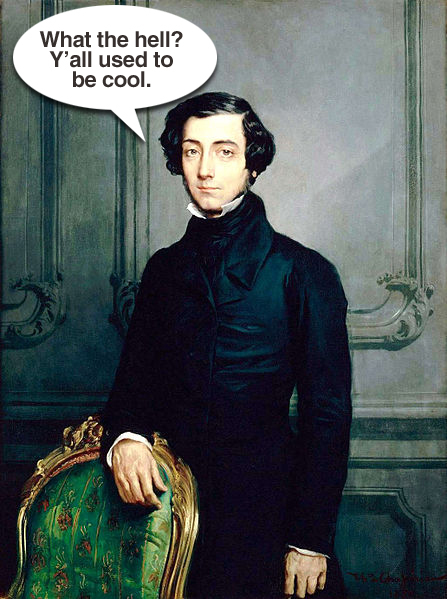 Tocqueville style. I thought that Christine Patton put it so well as you did that it’s not technology but community and people that can make things work. Thanks Keep Blogging, Keep Writing. Great post, Scott… thanks! The lead-in reminds me of a Southern Living Builders convention I was speaking at several years ago. The keynote speaker was a “housing expert,” and she made the assertion that because so many households are composed of “blended families” today, the ideal house was one where each member of the household could retreat into their own realm and not need to see any other member of the household all day long. “Unbelievable! !” was my response. Really enjoyed this post! You should check out CommunityMatters. CommunityMatters equips communities to engage citizens in a way that strengthens their places and inspires change. As an alliance of leaders in the community-building field, CommunityMatters champions the notion that communities have the power to solve their own problems and shape their own futures. We facilitate connections, provide education and infuse inspiration at the local level. We would love to share ideas and collaborate over Twitter, follow us @CommunityMttrs. Thanks, Logan. I’m definitely a big fan of CommunityMatters, as well as the Orton Heart & Soul work. Both deserve big props for being well ahead of the curve on the exact issues I’ve raised here. Looking forward to further interaction and sharing. Forgive me for being a pedant, but there is no such word as resiliency. It is resilience. It doesn’t beg the question, it raises it. The most astounding and confounding thing I hear, and it happens enough to make me think it’s a farely common sentiment, is that people still do have the idea of the “rugged individual” in their mind, as if that applies to almost anyone in a country like the U.S, or more to the point, that someone to whom that description does apply is better off than the rest of us. Who knew that civilization was a bad thing? A great many of us were born on second base and believed that we’d hit a double.